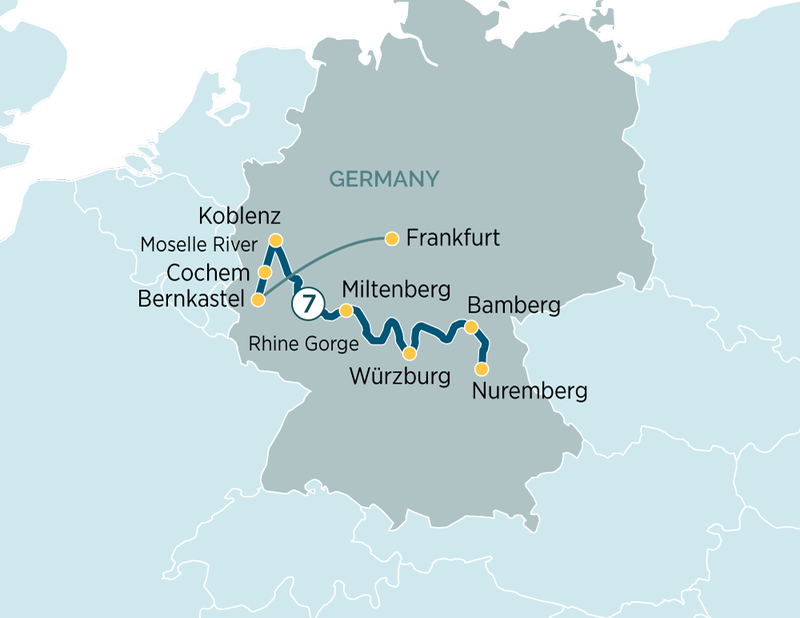 Bavaria is brought to life during excursions to UNESCO World Heritage-listed towns whilst every corner turned on this journey down the Moselle, Rhine and Main unveils rich history. Transfer from Nuremberg Airport and board your Emerald Waterways luxury river cruise ship where you will be welcomed by your Captain and crew. Nuremberg is situated along the Main–Danube canal, an engineering masterpiece linking the rivers of Germany with the mighty Danube which flows from the Alps to the Black Sea. Relax on board this morning as we cruise to Bamberg. Feel the magic of the past as you explore this UNESCO World Heritage city with your guide. Boasting one of Europe’s largest intact medieval town centres, Bamberg is bursting with character and charm. At the town centre is the largest preserved old quarter in Europe. Around 2,400 listed buildings and the centuries–old garden quarter form a special cultural heritage. Admire hundreds of building façades richly decorated in fascinating detail with spectacular ornamentation. This evening, the Captain will be delighted to welcome you to the Captain’s Welcome Dinner. Known as the “Pearl of the Romantic Road”, Würzburg is surrounded by sloping hills covered with vineyards. Visit the Bishops’ Residenz, one of Germany’s largest and most ornate baroque palaces and a UNESCO World Heritage Site. Your tour highlights the palace’s unique staircase, elaborate 18th century frescoes and the amazing 3–dimensional stuccowork. Wertheim and Miltenberg, are both quaint villages on the Main River. Today, you will have an included tour of the picturesque Miltenberg, which creates an imitable feeling of Bavarian life in medieval times due to the Old Town being lined with well-preserved half-timbered buildings. The gothic Merchant Hall is an impressive symbol of past affluence created by trade from river traffic. Today you arrive in Koblenz, where you will have a guided tour and a chance to visit the Ehrenbreitstein Fortress on the opposite side of the river. This fortress was part of the Prussian defences against the French in the 19th century and later used as a headquarters for the American military during WWII. In the afternoon, sail through the spectacular Rhine Gorge, passing countless castles and vineyards as well as the infamous Lorelei statue and Pfalzgrafenstein Castle, which was built on an island in the middle of the river as a medieval toll station. Countless vineyards and medieval castles line the shores of this section of the river, with photo opportunities at every bend. Today enjoy the enchanting town of Cochem. In the morning you will have a guided walk and the opportunity to visit the Reichburg Castle. This evening the Captain will be delighted to welcome you to the Captain’s Farewell Dinner. Dating back to 3000BC, Bernkastel is situated along the banks of the Moselle River and home to well-preserved buildings dating back to 1416. Enjoy a guided walking tour, where you will have a chance to stroll through the medieval marketplace with its gabled timber-framed houses castle ruins and town gate. Historically a winegrowing town, vines cover the steep-slopes surrounding the village. Alternatively, you will have a chance to take part on a guided bike tour in the Bernkastel area. Tonight, the Captain will be delighted to host a gala dinner. After breakfast it is time to farewell your fellow passengers and disembark the ship for your transfer to Frankfurt Airport for your onward or homebound flight. From the momentous cityscape of Prague to the serene beauty of the Moselle, join us as we tour Europe from the Czech Republic and on to the timeless passage of the Main, Rhine and Moselle rivers.